Engstrand hopes that the samples will reveal whether Ötzi had gastric ulcer and resistant bacteria. "We are performing DNA extraction to map the gastric and intestinal microflora from 5,000 years ago and to try out to find if he had any signs of ulcer-causing bacteria. We will probably be finished in a couple of months, that's my gut feeling," Engstrand told The Local on Wednesday. Engstrand and his team received faecal samples, as well as a 1 square centimetre section of Ötzi's stomach, on November 8th and will disclose their findings through scientific journals. Engstrand is working with other scientists in Germany and Bordeaux to find any possible resistant genes that Ötzi may have possessed before the antibiotic era. "We are quite convinced that we will find something. They have been found in soil bacteria. It will be interesting to see how these genes looked like then compared with today," explained Engstrand. "This is a scientific study for public health, antibiotic resistance and virulence as these genes may have evolved over the years," he added. Engstrand has never worked with such dated material, but pointed out that the material was long dead when they received it and as such, there are no viable organisms, so they are only working with DNA. "This part of the body has not been exposed to other contaminating bacteria. He has been frozen for so many years, the DNA quality is crucial to our success," said Engstrand. He added that the team will resume the research after Christmas and they expect to learn shortly thereafter if the DNA quality is viable for the study. Ötzi is Europe's oldest natural human mummy. His body and belongings are displayed in the South Tyrol Museum of Archaeology in Bolzano, northern Italy. 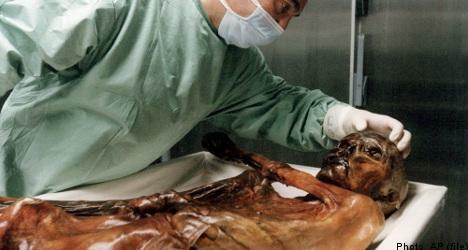 Initially, Ötzi was believed to be a modern corpse, similar to others found in the region. The crude methods used to remove him by Austrian authorities from a glacier resulted in damage to the hip of the body. At the time of his death, Ötzi was about 1.65 metres tall, weighed about 50 kilograms and was about 45 years old. When his body was found, it weighed 38 kilograms. Because the body was covered in ice shortly after his death, it had only partially deteriorated.